Photo by Sarah Osborne Bender. Our day started with Erin Blake, curator of art and special collections, giving us an overview of the Folger Shakespeare Library’s history and telling us a bit about who the Folgers were. The collection was a result of Henry and Emily Folger’s lifelong shared passion for collecting and Shakespeare. Though the Folgers lived in New York, Washington D.C. was chosen as the home for the museum, making it a gift to the nation. The neoclassical building was dedicated in 1932. As we were to see on a quick jaunt outside, the facade features marble bas-relief Shakespearian scenes designed by John Gregory and carved in-situ. The extensive collections, the largest Shakespeare collection in the world, include a vast array of materials. In her curatorial position, Erin oversees everything that is not a book, which means she is responsible for items such as furniture, paintings, snuff boxes, playbills, and much more. In the library, the Shakespeare Collection includes the first two complete folios of Shakespeare’s work, some with original binding. On our walk around the building, we encountered many special features of the design and construction of the interior spaces: period furniture, decorative glass windows, the vaulted ceiling of the Great Hall, and the evocative Elizabethan theatre. Folger was a big employer of many crafts people during the construction of the library at a time when jobs were needed as the country suffered from the effects of the Great Depression. After our history lesson and journey around the building, we began a tour of the current exhibition, Very Like a Whale. Just as fanciful as the cloud watching from which its title is derived, the show features abstract or fantastical photographs of a unique process paired sympathetic with passages from Shakespeare and accompanied by delightful cabinets of curiosity drawing from the Folger’s collections as well as those of the photographer, Rosamond Purcell. Drawing on literature, photography, history, rare books and printing, natural history and found objects, the exhibition related to many aspects of all of our professional activities and experiences. A visit to the photography and digital imaging lab made many of us starry eyed. Despite being below-ground, the space was beautifully lit and designed. Julie Ainsworth, department head, discussed her experience moving from a darkroom-focused lab to creating a space to accommodate the demands of digital image reproduction and rare materials. The copy-stands were monuments of precision, able to accommodate the wide variety of printed materials in the Folger collection. The minute attention to detail was evident, as well as a love of photography and a sense of humor: the ground glass from a vintage large format camera was salvaged and served as the window in a door between the office and the studio. 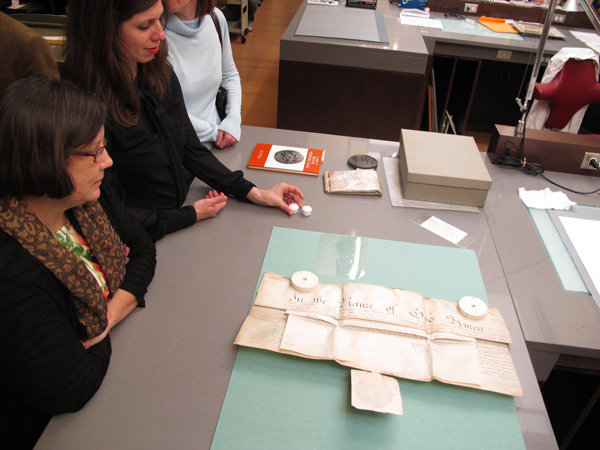 From the basement to the top floor, we paid a visit to Renate Mesmer and her colleagues in the conservation lab where one of many boxes of house deeds was being cleaned and their wax seals restored. Apparently the Folger is the leader in wax seal restoration, a specialization most of us probably didn’t even know existed. The care demonstrated in their hand-sewn felt pockets for the preserved wax seals and their in-house-developed phase box with Mylar spine were enough to make us all applaud. The day concluded with chapter business and conference planning meetings. For many of us who had not been to the Folger in a while, or who were visiting for the first time, the day certainly made all of us appreciative of the work that takes place there and probably made more than a few of us pull a Shakespeare volume off the bookshelf when we got home. – Write-up and photographs by Sarah Osborne Bender.